When you share a Meeting Template, Mixmax automatically determines your availability using your Google Calendar. From there, we use your meeting template settings to determine your availability. You choose the days of the week and time ranges you want to offer meetings. Just because you’re free Saturday night, that doesn’t mean you want to book a meeting then! First, choose whether to offer a certain day by selecting or deselecting the checkbox next to it. Next, choose the range of times during that day to offer as available. You can click the ( + ) circle to add multiple time windows. Buffer time indicates the minimum amount of time you'd like between the event to be scheduled and other events already on your calendar. It’s applied both before and after your Mixmax-scheduled event, preventing back-to-back bookings. For example, say a prospect wants to schedule lunch from 12 - 1pm, and your buffer time is 30 minutes. For the time slot to show as available, no other events can be scheduled on your calendar from 11:30am - 1:30pm. That buffer gives you just enough time to drive to the restaurant and back! To allow back-to-back bookings, reduce the buffer time to 0. This is how long your event will last. The length of your event, plus the buffer time you set (described above) need to be able to fit in between events already scheduled on your Google Calendar. Please note: Mixmax only supports meetings starting on the quarter of every hour. For example, if you’d like to set meeting duration to 20 minutes with a 0 minute buffer, you’ll see times offered from 9:00 - 9:20 am, 9:30 - 9:50 am, and so on. When off, slots longer than 15 minutes will be offered every half hour. 15 minute slots will always be offered on the quarter hour. You can constrain the days that you offer available times on your calendar. 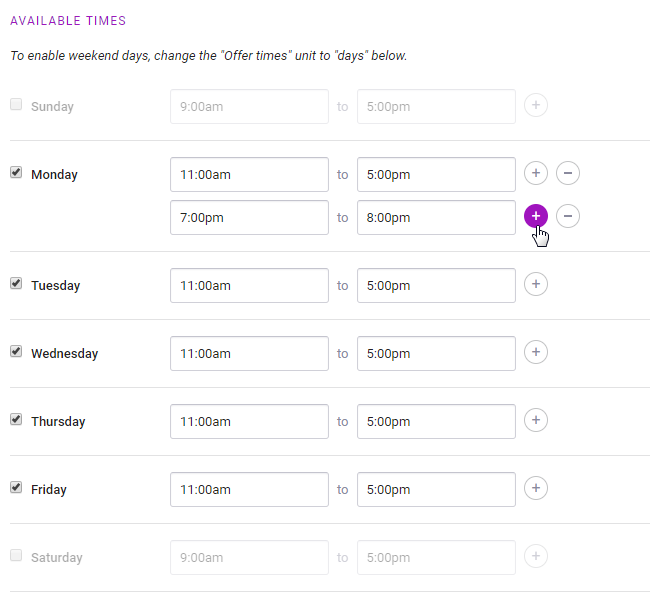 Next to “ Offer times”, choose the range of days to offer. Days can range from 0 days from now (today) to infinity days from now. To offer same day appointments, set the first “Offer times” field to 0. To start offering appointments tomorrow, set the first field to 1, and so on. Enable the "Specific Dates" setting to only offer times during a specific date range.